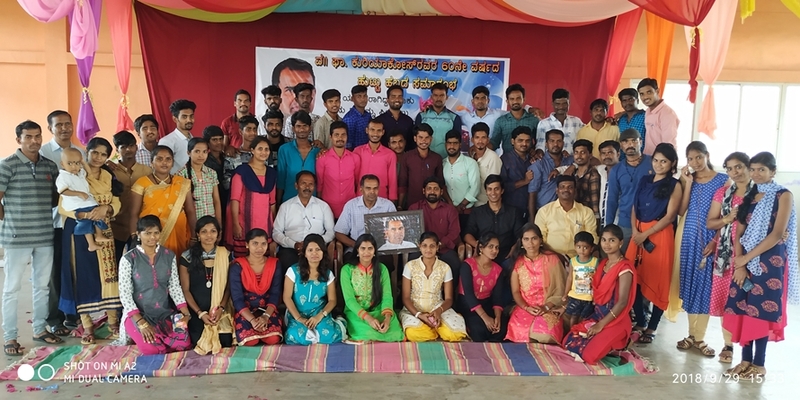 The past pupils of Don Bosco Child Labour Mission (DBCLM), Davangere organized the celebration of the 60th birthday of Fr Kuriakose Puthenpurayil Sdb, the founding Director. The executive committee of the past pupils of DBCLM met together weeks before and meticulously planned the programme. All the Salesians, staff and the students who were part of the center have been invited to be part of this special occasion. Apart from the local Salesian community Fr Chittilappilly Francis (BISS Bangalore), Fr Stephen D’Sa and Fr	Almeida (St Thomas Church, Davangere) and the Sisters from the Adorers Convent also were present for the function. About 65 past pupils who are studying or working in different parts of Karnataka turned up for the programme. The celebration started at 11:30 am with different cultural programmes, felicitation and cutting of the cake. The past pupils and children from the center had the opportunity to perform different cultural programmes. They had a lot of things to share and wish father all the happy returns of the day. all seemed very grateful to father for that he played in their lives. They were also fortunate to have him with them for a volleyball match after a delicious lunch.